Last night I had a dream where I was at my local comic book store and they were selling the Sideshow Weta Crazy Harry busted for just $50, the original retail price, which is a steal considering the Sideshow busts are now going for double, if not triple or quadruple the original price. I've had a few the last couple of weeks that I forgot to mention. I'll see how many I can remember. I remember one dream of seeing some of the Muppets in a movie from around 1977/78. I remember a few of the characters were riding along in some horse-drawn carts, just sort of humming quietly. Some human companions were riding behind them on horses. One cart had a box with Kermit and Robin in it, with Fozzie riding behind the box. 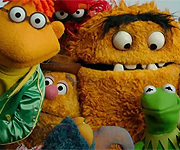 Another had Gonzo, Sam, and I think Mahna Mahna in it. I recall Sweetums also being there. 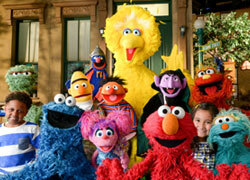 Another one I recall involved a demonstration of several Big Bird head puppets. For some reason, they were all purple, and the mouths didn't move very well. At the time, my brain was probably thinking of a story that I had heard on Muppet Wiki sometime ago about using the old "Blue Bird of Happiness" head to train new puppeteers. Twisted Tails and FrackleFan2012 like this. I don't know if waking up humming a muppet song counts as a dream, a few weeks ago I woke up humming 'Can You Picture That?". I wonder if that is all that I can remember from a muppet dream that I can not remember? Last night, I dreamt that me and the Muppets wanted to do our own production of "Grease" because they thought they can do a better production of it than what my school did. Then Floyd and Janice both refused to sing "You're The One That I Want" because they said the song was too "overrated" and "lame." Instead, they agreed to sing the other song that was in the original Broadway production of Grease (It's called "All Choked Up". The link to the song is below). Act 2, the random female whatnot who got cast as Cha Cha got sick. Walter volunteered to go on as Cha Cha because there was no other female brave enough to do it. But then when got on stage, he realized he didn't know how to dance. So near the end, Floyd accidentally swung Walter into the orchestra pit. Mildred, who was playing Miss Lynch, just threw the "trophy" down to the injured Walter. Janice still sang "Hopelessly Devoted To You" but Miss Piggy couldn't help but go onstage and sing it with her. (She didn't care though.) All Choked Up (the second to last song) was INCREDIBLE (Enough said). Floyd and Janice kissed at the end, too. ConsummateVs, Dominicboo1 and Mo Frackle like this. Huh. Sounds like it'd make an interesting fan fic. ConsummateVs, Twisted Tails and MissMusical12 like this. I had a dream that I was in a really tiny (it could barely hold me) closet type area, with two doors, both of which were locked. Gonzo and Sam were also there, thought I don't recall why (I'm guessing they were trying to get me out). Later, I dreamt that I was asking Grover a disco-related question (probably based on the front cover of "Sesame Street Fever"). The other day I dreamed with a Electric Mayhem Special on TV. It was so cool! Twisted Tails, MissMusical12 and Mo Frackle like this. I had another Muppet Glee dream. I was auditioning for the Glee Club, singing for the cast, but the band in the background was The Electric Mayhem. Then suddenly (as often happens in dreams) I was sitting in a boat docked on a riverside, and Kermit the Frog was standing there with Emmet Otter. I would LOVE an Electric Mayhem TV special! Twisted Tails and DrDientes like this. I had a dream last night where I was watching a Muppet movie that, in my mind, I apparently saw when I was a kid (the first and only time I've seen this was in my dream last night). The only scene that I remember is Miss Piggy and Janice on a train, talking about how strong their friendship has gotten over the years. All of a sudden, there's a brief closeup of Janice's face, where she looks exactly the same as she always has. She wanders off for a second, then comes back looking different. Her hair is piled up on her head in a beehive style, her eyes are the more generic Muppet eyes (white circle with black dot in the middle), and she has a pointy nose! For some reason, I said to myself "Wow, that scene freaked me out when I was little." ConsummateVs, Janice+Floyd<3, Fragglemuppet and 2 others like this. Oh yeah, I've had dreams like that before. Where your mind tells you "this happened before" when it really never did. Odd. Last night I had a dream wherein I was in a store that had rare, hard to find Muppets Christmas ornaments for only $8 each, no doubt inspired by the real life event of me finding Hallmark's Kermit/ Piggy "On Frozen Pond" ornament for just $8 at a flea market last Saturday. Last night in part of my dream I was playing Super MarioKart 64 and found out that Scooter (Yay!!! ), Fl0yd, and Lew Zealand were hidden unlockable characters within the game. You had to perform a variety of special tasks, such as smashing a bridge of ice, to unlock them. I had a dream last night where my mother and I went to the Today Show to see a performance by One Direction outside of Rockefellar Plaza. The audience including real-life teenagers, Muppet penguins, and Gloat. When One Direction finished their song, the audience screamed and cheered as fireworks went up to the sky, even though it was morning. I started to scream after everyone else did. They all looked at me. I even made my mother almost deaf. I was worried about my mother. Well, at least my mother isn't deaf. I had a dream last night where for some reason I was helping Miss Piggy do some gardening. But the garden was actually the little garden that is in front of my house. Piggy made me do most of the actual gardening, and one of the things she had me do was measure the distance between the front door of the house and a big rock that was in the garden, which made no sense. But I didn't care, because I was just excited to be spending time with a real Muppet. I think Kermit was also there for a while, but he left about halfway through the dream. Last night, I had a dream where I was watching alternate takes from A Muppet Family Christmas featuring The Count singing the solo parts for "Good King Wenceslas", "Ding Dong Merrily on High", as well as a completely new song that was in E-major. It's beat was similar to the one from "One Banana" from Sesame Street. The song started with the Muppets singing "Ah ah aaah", in the style of Twist and Shout like this Isely Brothers version at the 1:32 mark. Then before The Count sings his solo, Rizzo says something like "Hey, there's The Count!" The Count was wearing a sombrero during this song. One part of the song had The Count saw three birds, also wearing sombreros. (which were the blue baby birds seen in the Jean-Pierre Rampal episode of TMS). I feel like that I'm one, one batty dreamer! Ah ah ah! Piggy The Frog, PanthraDion, MissMusical12 and 2 others like this. I had a dream last night where I was watching a c. 1982-1984 gala celebration special celebrating Red Fraggle which aired in the U.K. I found out that there were originally nine episodes of this series but only one existed. Red Fraggle (strangely wearing a black tuxedo) was sitting on the seats in the audience when Red was introduced in the intro. Other attendees included Count von Count, who was wearing a blue tuxedo, Uncle Deadly, and Louis Kazagger (the later two I found out on the description of the special). Wow, I thought this was all real at the moment. I had a dream last night where I went to Walt Disney World with my dad and several other members of my family. While I was there, I discovered a new ride that was some sort of combination between Muppets and mummies. Last night, I had a dream where there was a extra scene from The Muppets Celebrate Jim Henson, in which Scooter, Gonzo, Fozzie, Rizzo, Robin, Bean Bunny, along with Kermit the Frog, Pink Frackle, Youknow Bird, the corn from Sesame Street (who was jumping up and down during this song), and others were singing a song that was similar to "We're Not Gonna Stop" from The Muppets at Walt Disney World. The song first started out with Scooter, Kermit, Robin, Bean, Gonzo, Fozzie. Then, as the song goes on, the Pink Frackle, Youknow Bird, the corn, and other characters appears on the upper part of Backstage and flashing lights and colors appeared. As the song ended, everything went back to normal and some of the characters left. Also in that dream, when I was looking up on Youtube, I found French Fraggle Rock PSA's that were all over a white background. These videos included Placido Flamingo from Sesame Street holding and meeting up with Cotterpin Doozer in his hand, and Uncle Matt talking about Fraggles tasting crystals, which included Gobo, Mokey, Wembley, Boober, Red, and a few background Fraggles eating them and spitting them out for some reason. Another video I was was where the Fraggles were protesting and holding up picket signs. There was black Chinese text on the middle screen and Gobo was spoke French. I wasn't sure what Gobo was saying during that video. And then, I woke up. I wish those PSA's were real.